I didn't think I liked fruitcake until I started making my own. Start this fruitcake about a month before you want to enjoy it. This recipe makes two 9-inch loaf cakes, so you'll have one for yourself and one to give. 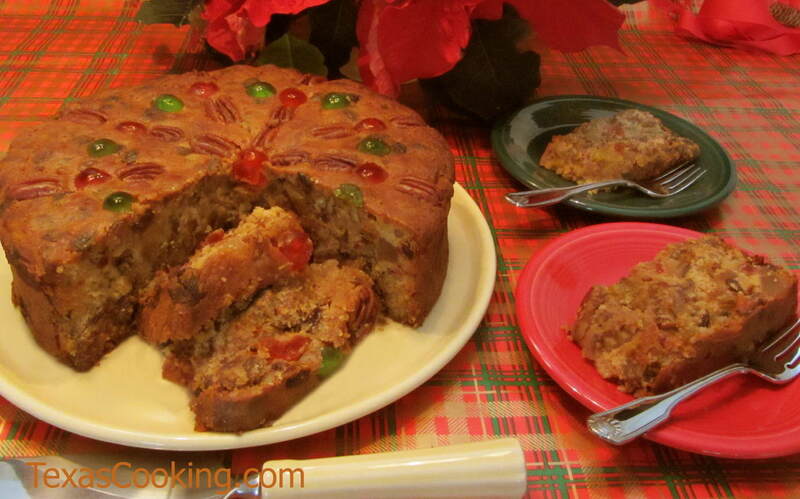 OR do as we have done in our photo, above, and use a 10-inch springform pan to make one great big lovely fruitcake. In this instance, I used 1/2 cup less brandy than the recipe calls for. After it was baked and cooled, I wrapped it well in two large pieces of heavy-duty aluminum foil. A week later, I unwrapped it and sprinkled 1/4 cup of brandy on the top, turned the fruitcake over and sprinkled the other side with 1/4 cup brandy. I repeated that task for the next two weeks, and a week after the last brandy spike, I could wait no longer. It was ready -- moist, fragrant, delicious. Bake in preheated oven for 1-1/2 hours (or 1 hour 45 minutes for a single round fruitcake) or until a cake tester inserted in center comes out clean. Let cakes cool in pans for 20 minutes, and then turn out onto racks, and cool completely. Place each cake on a large sheet of aluminum foil. Sprinkle each cake with 1/4 cup brandy. (See Note, below) Wrap each cake tightly in the aluminum foil, sealing well. Store in a cool dark place. Makes two 9x5-inch fruitcakes (or one 10-inch round fruitcake). Note: Don't just dump the brandy over the cake. It takes a little patience, but let the brandy drip onto the cake so that it is absorbed. If you like, use a toothpick to make small holes in the surface of the cake.